Stuart Corbett-Byers was re-appointed as the Captain of the Dumfries 1st XI for season 2011 at the recent Dumfries Cricket Club AGM. He is continuing as skipper after he successfully led his side to the National League Division 2 title this summer. 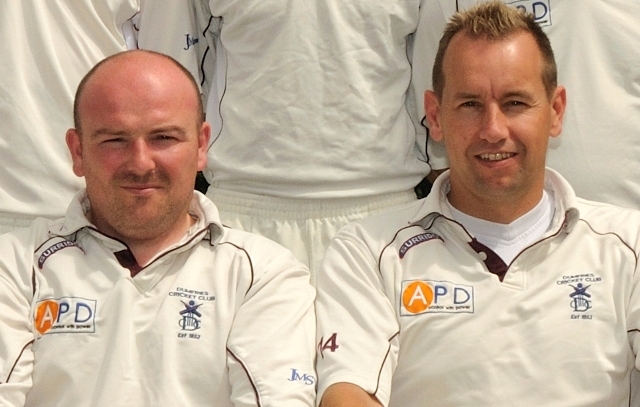 He and Vice-Captain, Jim Patterson, face the challenge of a reorganised league next year. The three ten team divisions of this year have been restructured into two National divisions of sixteen, the SNCL Premiership and the Championship. This means that Dumfries will be facing the likes of Poloc and Stenhousemuir in the Championship next season. Also continuing as 2nd XI Captain and Vice-Captain are Stuart Alexander and Davie Davidson with the side again playing in Western Union Division 2 after the Nunholm side finished fourth. Chairman Rory Fergusson said “The club are fortunate to have such a wealth of experience leading both league sides. We are hopeful that the firsts can maintain their form next season and mount a challenge for the first Scottish Championship title and that the seconds continue the development of the club’s younger players”. The presentation of the season’s Club Awards takes place this Saturday at Nunholm after the Annual Dinner with guest speaker Sandy Strang on hand to mark the club’s most successful year ever. More information on playing for the club can be found at www.dumfriescricketclub.co.uk.